Live the dream, right at home on your own park like acreage with all the extras you could ever want...including a NEW ROOF!! Oversized 20x30 workshop with it's own office, a tiki hut, a barbecue/fire pit with picnic area...it even has a chicken coop!! The home is over 2400 sf of roomy comfort!! Beamed ceiling in the living & dining area! Stone fireplace!! Great big kitchen for family gatherings...you can just bring everyone home for the holidays! Plenty of room to add a pool, but if you don't want to keep up a pool, you are almost directly across from the Whispering Pines Park entrance...with it's olympic size pool, jogging trails and more! 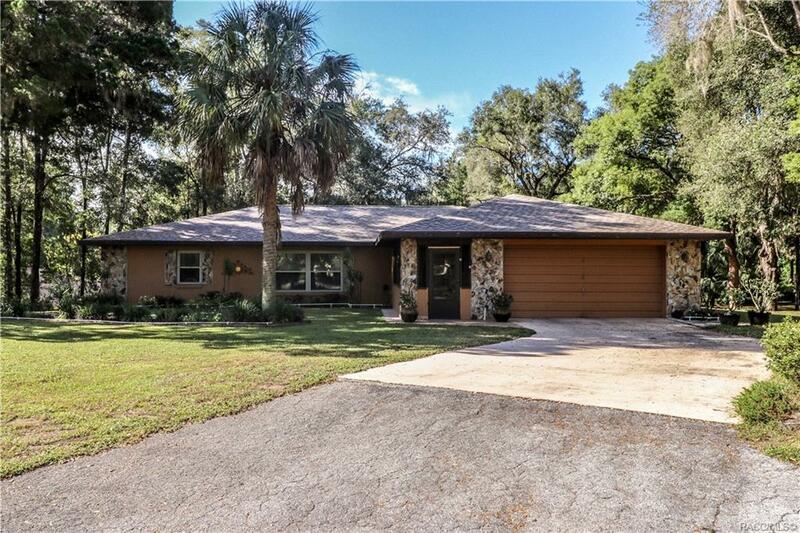 Check it out at https://www.inverness-fl.gov/169/Whispering-Pines-City-Park-Pool ...property is close to the lake, the Withlacoochee Bike Trail, shopping, medical facilities...the list is endless...country quiet 5 minutes from town!! What more could you ask for??? Don't let this one slip away! Call today!! © 2019 Citrus County Board of Realtors. All rights reserved. Information deemed to be reliable but not guaranteed. The data relating to real estate for sale on this website comes from Citrus County Board of Realtors and the Broker Reciprocity Program.sm. Real estate listings held by brokerage firms other than LAndmark Realty are marked with the BR logo and detailed information about them includes the name of the listing brokers. All measurements and all calculations of area (i.e., Sq Ft and Acreage) are approximate. Listing broker has attempted to offer accurate data, but buyers are advised to confirm all items. Information last updated on 2019-04-18.